PS is a naturally occurring phospholipid in the brain that exerts a number of metabolic and pharmacologic effects. Numerous studies have documented the impact of PS on specific neurotransmitters in the brain including acetylcholine, serotonin, norepinephrine and dopamine*. PS is a naturally occurring phospholipid in the brain that exerts a number of metabolic and pharmacologic effects. Numerous studies have documented the impact of PS on specific neurotransmitters in the brain including acetylcholine, serotonin, norepinephrine and dopamine*. Many researchers also agree that all of these neurochemical systems are involved in age-related cognitive functioning*. A recent 6-month Israeli study showed that patients taking 300 mg of PS per day had positive results in attention, concentration and memory*. When individuals were supplemented with 300 mg daily of PS for 45 days, the results showed consistent improvements in behavior*. Fahey and Pearl, 1998 Biology and Sport, indicated in a balanced order, double-blind cross-over design study, that PS supplementation decreased cortisol after exercise*. This is possibly due to decreasing ACTH while subduing the negative effects of intense weight training (perception of well-being and muscle soreness)*. 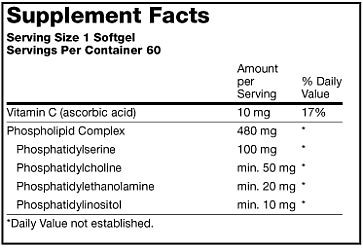 Directions: As a dietary supplement, take 1 softgel up to 3 times daily with a meal or as recommended by your qualified healthcare provider. Other Ingredients: Gelatin, other phospholipids, glycerides and soy oil.